This page is dedicated to the remembrance of those who fought in the Great War of 1914-18. The Lost Generation to whom we owe our gratitude and interest in understanding the horrors they faced. BBC WW1 in-depth BBC reference material on the causes, events and people of the conflict dubbed the ‘war to end all wars’. First World War This is a multimedia site which includes information on the origins and battles of World War One, and includes photographs and a timeline. Roll of Honour This site contains a selection of UK county war memorial details. Stow Maries WW1 Aerodrome The only remaining WW1 Home Defence Aerodrome with original buildings. The Imperial War Museum The Imperial War Museum covers conflicts, involving Britain and the Commonwealth, from the First World War to the present day. The Long, Long Trail This site is about the British Army in the First World War; aimed at the family and military researcher. Western Front Association The Western Front Association site is aimed at helping anyone wishing to gain further interest in the Great War of 1914-1918. 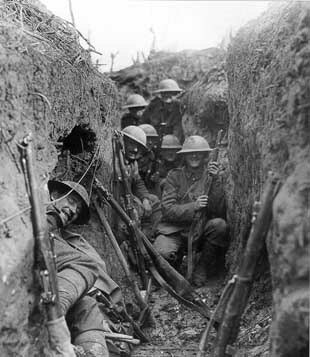 World War 1 Trenches on the Web This site contains a wide range of World War One material.